Effipro Extra Large Dogs is for dogs weighing between 40 and 60Kg. Use Effipro extra large dog in the treatment and prevention of infestation of fleas for up to 8 weeks and ticks for up to 4 weeks. 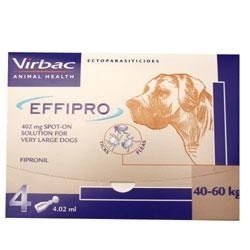 Effipro Extra Large Dogs administration: by topical application to the skin, 1 pipette of 4.02ml per dog. THIS PRODUCT IS A RESTRICTED MEDICINE AND YOU MAY RECEIVE A CALL OR EMAIL FROM ONE OF OUR RESIDENT SQPS. PLEASE CHECK YOU HAVE ORDERED THE CORRECT PRODUCT FOR THE WEIGHT OF YOUR ANIMAL.